February: A full house in Alexandria, MN for the Douglas County One Book, One Community Read! Thanks to Tessa Dutcher for the photo. 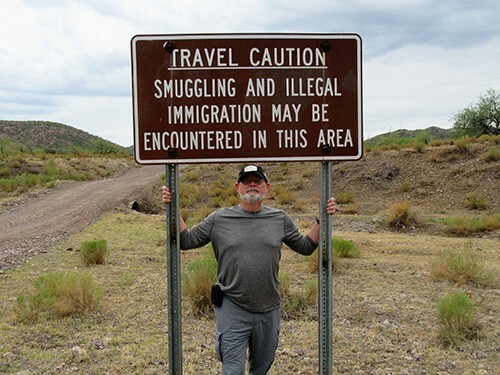 March: I visited southern Arizona to research #16 in my Cork O’Connor series, Sulfur Springs. 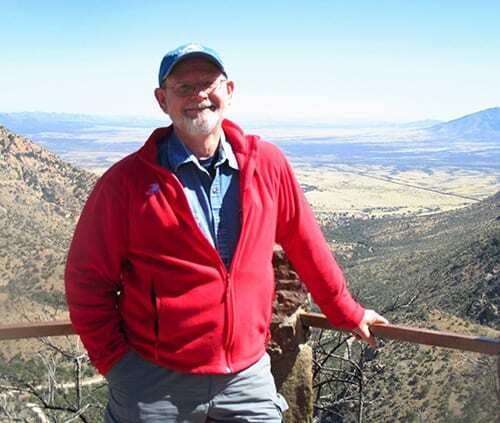 Here I am atop Montezuma Pass in the Coronado National Memorial. Visible behind me is the wide San Pedro River Valley, the route Coronado used to enter this territory. It’s also a corridor for the entry of illegal aliens seeking sanctuary here in the states. Sulfur Springs will be about this difficult situation confronting Americans north and south of a border now marked by an enormous fence visible even from this great height. April: My wife and I spent a weekend in Omaha with lots of family. While there, we visited the National Park Service’s Lewis and Clark National Historic Trail Headquarters. Fascinating! 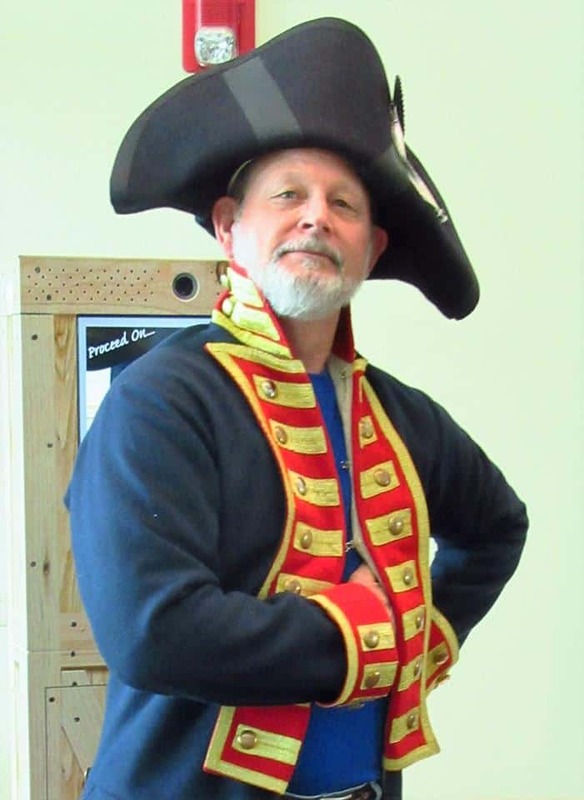 Among the many items on display were reproductions of the uniforms the expedition’s two leaders wore to impress the Native population they encountered. Anyone could don the clothing, and I couldn’t resist. But I think I look more like Napoleon than Meriwether Lewis. June: Why do I love small town libraries? Because the wonderful librarians there know small town politics. 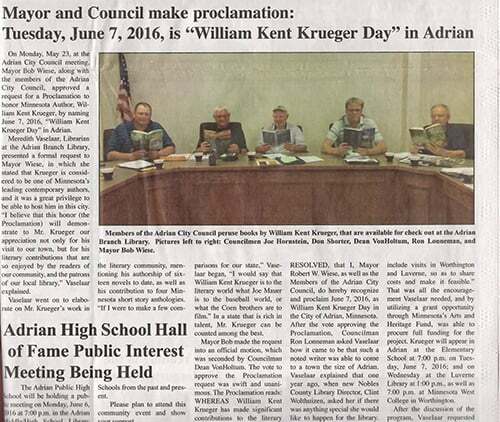 Just look what Meredith Vaselaar, director of the branch library in Adrian, Minnesota, twisted the arms of the mayor and the city councilmen into doing for the day of my visit there. A ticker tape parade down Broadway in New York City couldn’t be any sweeter. 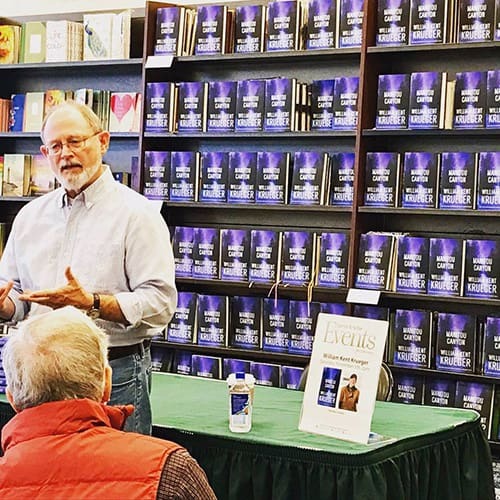 July: I was in Petoskey, Michigan, for a couple of book events sponsored by the Bay View Association, a Chautauqua community. As many of you Hemingway fans may know, Petoskey was one of Papa’s favorite haunts as he grew into manhood and became famous. Here I am at the City Park Grill. In Papa’s day, it was called the Annex, and he spent a good deal of time sitting at this bar, drinking, writing, probably holding forth vociferously with the locals. That’s him above me on the wall. 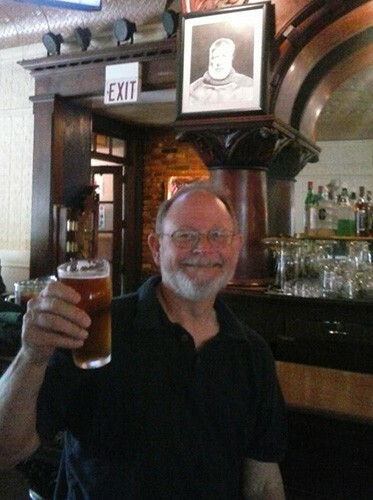 I had to sit in the place he usually occupied (second stool from the end) and lift my glass in a toast to his memory. August: Back to the southern Arizona desert, spitting distance from the border, to research Sulfur Springs. Don’t ever say that I don’t put everything on the line to make sure I get my stories right! 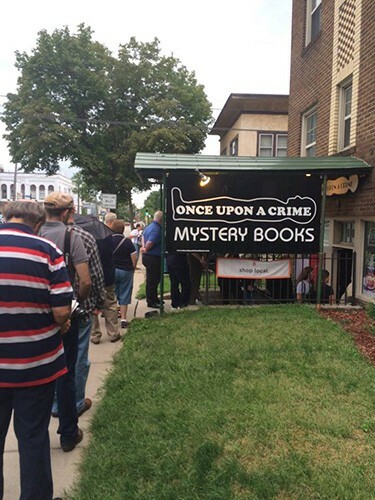 September: The Manitou Canyon book tour kicked off at Minneapolis’ Once Upon a Crime. 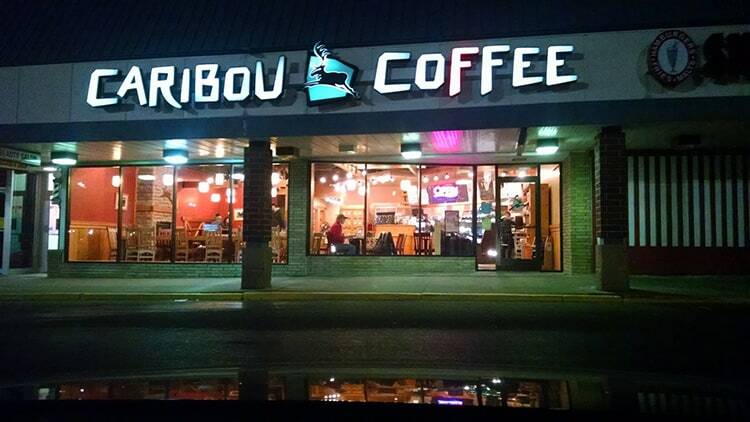 Thanks to Mindy Mejia for the photo. 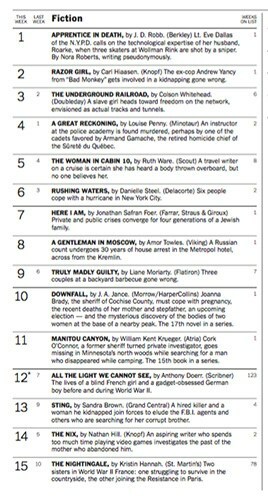 Manitou Canyon debuted at #11 on the New York Times bestseller list. Wahoo!!! Thanks to everyone who bought a copy early to help this happen. 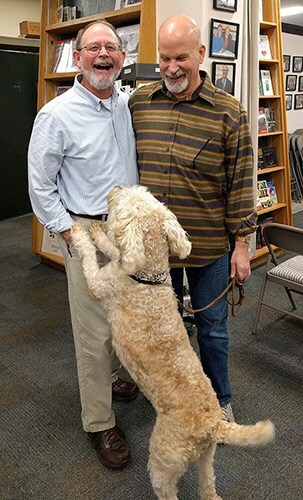 October: Writer David Corbett and his dog Hamley were among the crowd at Book Passage in Corte Madera, CA. At the Great Valley Bookfest, held yearly in Manteca, California, the town in which I was living when I graduated from high school. What a terrific celebration of the written word. And just look at this! 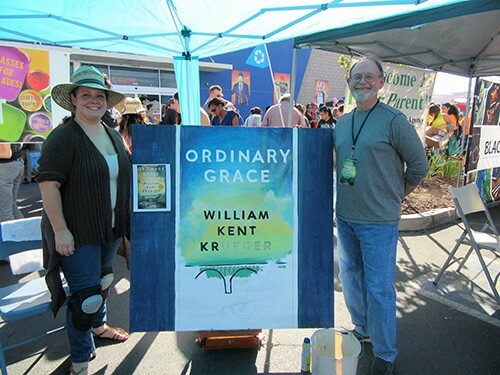 Local artist Kathleen Banzon was commissioned to paint the cover of Ordinary Grace for a permanent collection the Bookfest has begun. It wasn’t quite finished, but I was so honored to see this beautiful beginning. 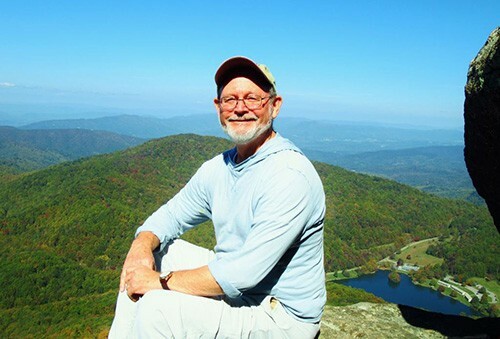 On Sharp Top Mountain in Virginia. November: The Sioux Falls Barnes & Noble really stocked up on Manitou Canyon! 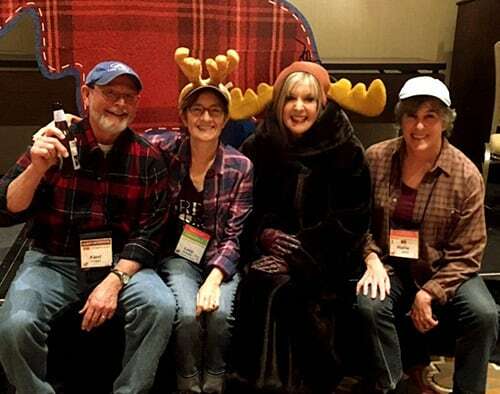 At the New England Crime Bake’s “Mooses & Hunters 2016,” with Lucy Burdette, Hank Phillippi Ryan and Hallie Ephron. 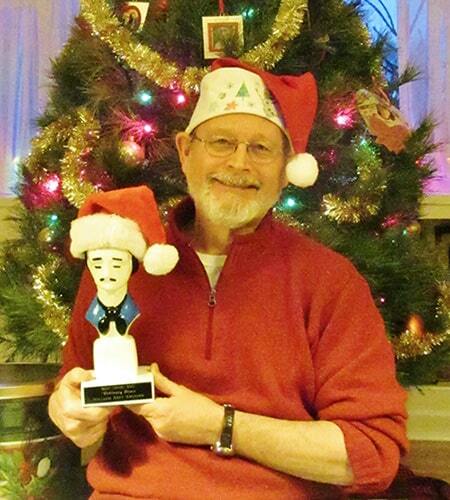 December: Mystery Writers of America has asked those of us who’ve been fortunate enough to receive an Edgar Award for our work to send a current photo, author and the Edgar together. Eddie and I wish you all Happy Holidays and a Joyous New Year!